The Mahatma Gandhi Centre for Sanitation, Cleanliness and Community Health, a joint initiative of Observer Research Foundation (ORF) and Triratna Prerana Mandal joined the Central Railway as part of the nation-wide launch of the Clean India Campaign to undertake a mass clean-up drive at the iconic Chhatrapati Shivaji Terminus (CST), Mumbai on Gandhi Jayanti. 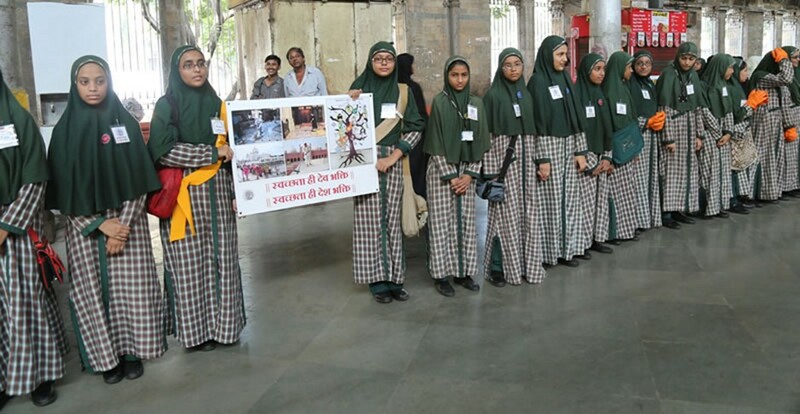 Researchers, interns, volunteers and activists of the Mahatma Gandhi Centre were supported by nearly 75 students and teachers from the Al Mu’Minah Girls’ School at Masjid Bunder, and many other citizens worked hand-in-hand to clean CST’s Platform No.1 and the adjoining entrance lobby of the train terminus. 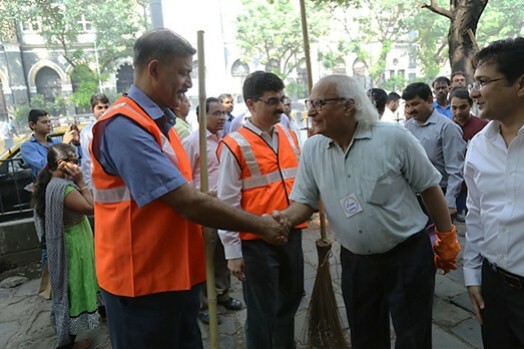 “We welcome the effort put in by the Mahatma Gandhi Centre for helping Central Railway kick-start its own contribution to the cause of a clean India as envisaged under the ambitious Swachh Bharat Abhiyan,” said Shri Sunil Kumar Sood, General Manager, Central Railway, who, along with his senior zonal colleagues, swung into action since early morning, sweeping and mopping up the UNESCO World Heritage Site, which was awaiting a visit by the Railway Minister Shri D. V. Sadanand Gowda in the afternoon. “If the Clean India Mission 2019 has to succeed, India needs good governance at the central, state, city and village level. However, it also needs better governance on the part of citizens. The people seem to have responded to the Prime Minister’s clarion call with great enthusiasm and seem to have finally realised that the objective of a Clean India can never be achieved by the government machinery working in solitude but with the individual contribution of all,” said Shri Sudheendra Kulkarni, Chairman, ORF Mumbai, wiping sweat off his forehead before quickly going back to raking the dirt accumulated at a small green patch outside the station. 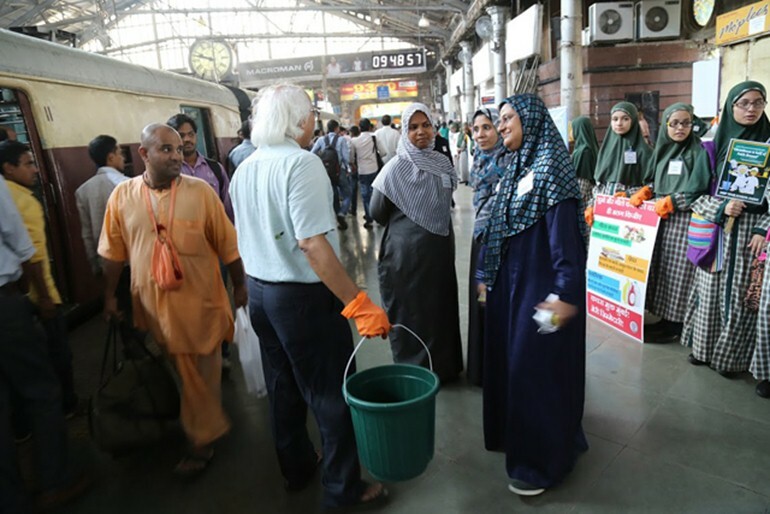 “The manner in which this clean-up campaign has got tremendous support from various organisations in Mumbai and the general appreciation it has earned from the commuters, gives us hope that we will be to sustain this cleanliness campaign and make all our stations clean and pleasant for the passengers. In fact, this is so enthusiastic a response that even we senior Railway officials are inspired to pick up the broom,” Smt. Pramila Bhargav, Secretary, Railway Board, who had specially come to CST for the clean-up drive. CST, which daily handles millions of commuters of the Mumbai suburban railway network and thousands of passengers of its CR’s long distance services, despite being the ‘world’s second grandest railway station’, fails to live up to the high standards of its counterparts from around the world in terms of general cleanliness and commuter amenities. The station is littered with garbage, ugly – mostly half-torn posters on the walls – and the splotches of a million spits and paan stains. JOB DONE OR STARTED? 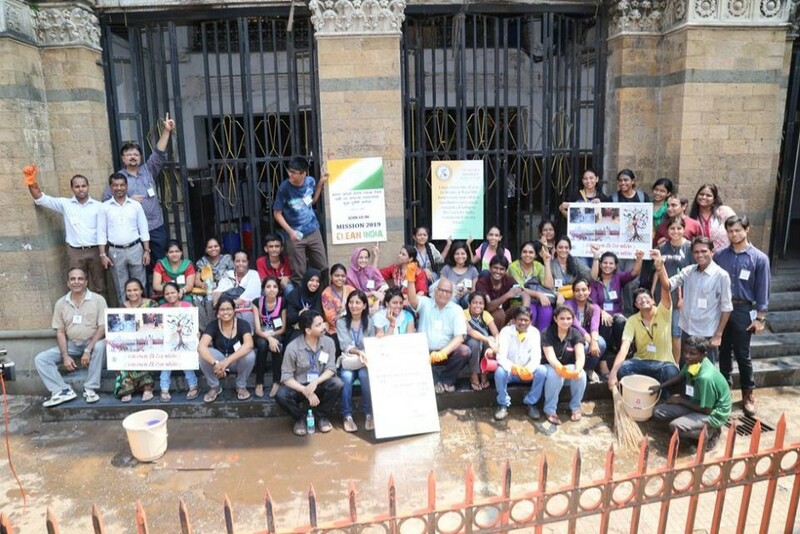 Mahatma Gandhi Centre team and volunteers outside the CST station. 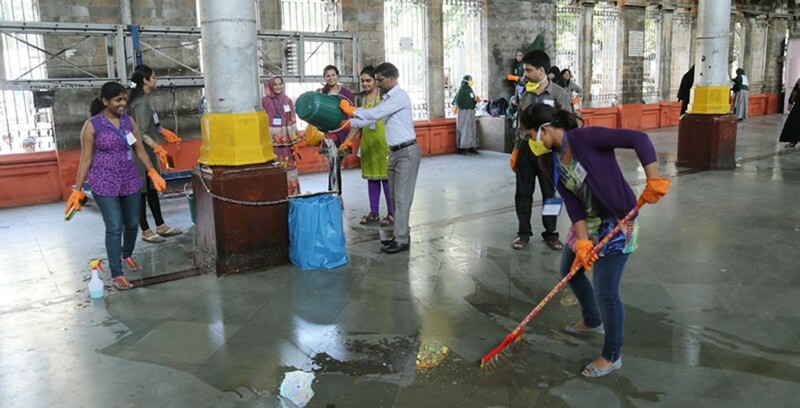 Mahatma Gandhi Centre team and volunteers giving the CST a much-deserved scrub. Shri Sunil Kumar Sood, General Manager, Central Railway, who along with his senior colleagues picked up the broom to launch the Swachh Bharat Abhiyan at the iconic CST greeting Shri Sudheendra Kulkarni. Children from the Al Mu’Minah School participating in the CST Clean-up Drive organised on Gandhi .Jayanti. Categories: Dhaval Desai | Permalink. The Mahatma Gandhi Centre for Sanitation, Cleanliness and Community Health, is an initiative of Observer Research foundation Mumbai in partnership with the Triratna Prerana Mandal. Inaugurated on Independence Day 2014, this Centre aims to take up research, policy advocacy, activism and leadership development in the areas of slum sanitation, waste management, waste recycling, water conservation and public health in Mumbai and the larger Metropolitan Region (MMR). It will especially focus on ensuring women’s safety and dignity in urban sanitation.